Have you ever found yourself in an Android vs IOS debate? Of course you have! The dude on the Android side always has one decisive point which the IOS dude fails to answer: Hey but we can customize our phone way more than you guys!!! And if you are not familiar with the phrase Way more customization that we droids love to throw around, we are talking about Android Launchers. So what is a launcher anyways? Every Android phone has a launcher. Whether it be a Samsung Galaxy or a Google Pixel, every phone comes with a manufacturer installed launcher. Samsung calls its launcher The Samsung Experience or more recently One UI while Google tends to use Pixel Launcher on their phones. But not all launchers are created equal and this is exactly where Android shines. In the Android world, if you are unhappy with your manufacturer installed launcher you just hit the Play Store and find a new one. It is as simple as that. And Android launchers are some of the most genuinely helpful apps. They offer customization options, gesture support, icon packs, performance enhancements and what not. So here is our list of Top 5 Best Lightweight Battery Saving Android Launchers..
First of all props to the developers of this app. Lawnchair Launcher is an experience that is still unrivaled on the market. The launcher launched last year to wide spread acclaim not because it has everything but the kitchen sink but because the way things work. Right of the bat you are getting Google Pixel experience on your phone. That means smooth animations, extremely snappy and efficient operation and features that features that were previously reserved for only Google devices. The launcher also supports icon packs and various other customization options. And the best part is, it is completely free and always will be because its an Open Source project. Even after several years on the market, Evie Launcher is still one of the most fluid and efficient launchers out there. It is uniquely refreshing after using something like Nova Launcher. From the homescreen to the app-drawer everything is fluid and buttery smooth. But performance isn’t its only strong point. In addition to being snappy, Evie Launcher is also feature rich. You can customize almost everything From app icons to wallpapers and animations. And not only that the trademark features like Universal Search make the Evie Launcher an absolute joy to use. This is one is special. Niagara Launcher is not your typical everyday Android launcher. Other launchers may provide your more customization options and more unique features but one thing most of them lack is minimalism. This is exactly where Niagara Launcher shines. The app, though still in development, boasts the cleanest UI we have seen to date. No distracting rows and rows of apps, no juggling of hands to reach the corner of the screen to press a button. Heck you don’t even need to swipe to open the drawer. Everything is built with the sole goal of facilitating one handed use. Aside from the minimalism, the app also offers snappy performance and great battery efficiency. All in all Niagara Launcher deserves your look. Hyperion Launcher is the new kid on the block. Developed by the folks at projkt.io, the team behind Substratum, Hyperion launcher promises up to date features, customization that goes beyond the ordinary and speed and efficiency to match. 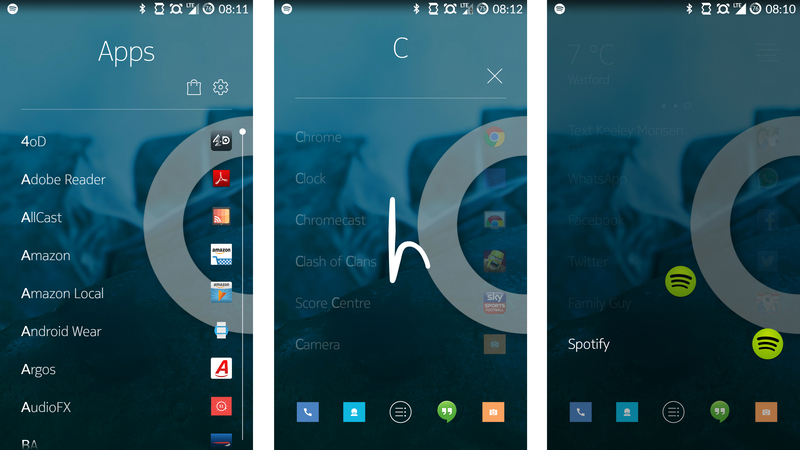 In addition to supporting new features, at times as soon as Google develops them, Hyperion Launcher also provides extensive themeing capabilities. Folders, widgets, app drawer and homescreen all can be themed. Animations can also be customized. And most importantly No bloatware! Putting everything into one short sentence: Hyperion Launcher is awesome. Okay hear me out! If you all you want is an Android Launcher that just works then lo and behold Google Now is your savior. It may be old. It may not have been updated for quite a while but it works. And let me say this: it works like it should work. No hassle, no annoying bloatware, no unnecessary features and forget about over the top customization as well. Google Now does what it was developed to do: to rescue you from your bloat-laden device and does this efficiently.